Shoshana with her caregiver, Yafi Monbi. The Claims Conference supports in-home care programs to help survivors like Shoshana remain safe and comfortable in their own homes. It was raining hard on Shabbat, June 1, 1944 when Shoshana Ceizler (neé Blima Harshani), age 19, and her family were taken out of their homes in the ghetto in Košice, Czechoslovakia with the other Jews and put into cattle cars. She remembers that the infamous Nazi doctor Josef Mengele greeted their train at Auschwitz, directing Shoshana to a different side from her family. Her mother ran after her. “Mengele told her I was going to be sent to work and asked, ‘will you be able to work?’” She answered, “Of course.” Mother and daughter remained together and were liberated together. In October 1944, Shoshana and her mother were sent by train to Nuremberg, while her younger brothers and father remained at Auschwitz. When the youngest brother cried at being separated from his family during a selection, the older brother left their father and joined the boy. Both were sent to the gas chamber. In Nuremberg, Shoshana and her mother worked in a Siemens factory with 450 girls and women, cleaning parts from planes that had been shot down. Each had a bed in the trailers; they thought it was paradise. From there they were transferred to a farm, where they also worked cleaning plane parts. On May 5, 1945 Shoshana and her mother were liberated by the U.S. Army. Her father had died from tuberculosis three weeks before liberation. 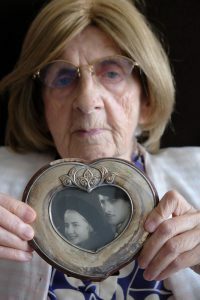 Shoshana’s holds a photo of herself with her husband, who was also a survivor from Košice, taken after the war. Six months later, Shoshana married a Holocaust survivor from Košice. In February 1949 they made aliyah to Israel and settled in Kerem Maharal, a moshav community in northern Israel which was founded by Shoah survivors, many of whom were from Czechoslovakia. They had two children, 19 grandchildren and 30 great-grandchildren. After 20 years in Kerem Maharal, they moved to Haifa and from there to Tiberias, where her husband was a construction contractor and built many communities. The couple has been living in Jerusalem for the last 26 years. Shoshana, who is now 91, received a payment from the Former Slave and Forced Laborers Fund, which was negotiated with Germany by the Claims Conference. Shoshana has assistance at home, with 30 hours of home care per week partially funded by the Claims Conference. 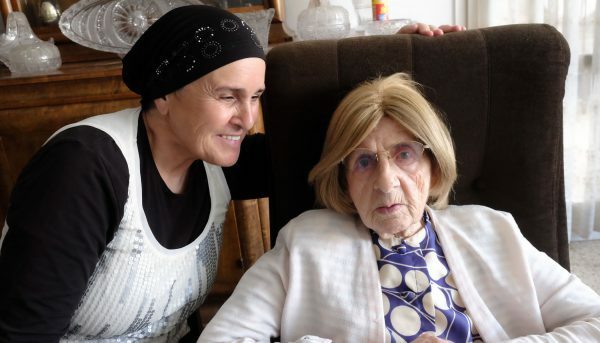 The assistance Shoshana receives from her home care worker is a big help in her daily life. The work of the Claims Conference in Israel helps the largest concentration of Holocaust survivors in any country in the world. One-third of all elderly citizens in Israel are Shoah survivors. With our help, Shoshana can live in dignity, receiving assistance she needs so that she can remain in her Jerusalem home.